Everything you want in a home. Spacious living plan plus a 2bedroom unauthorized suite in a great neighborhood. This meticulously maintained 1 owner home featur es a gourmet kitchen with loads of dark chocolate cupboards. High quality finishing throughout wiht beautiful crown mouldings. Flat screen TV and suround sound system to stay. RV parking or extra parking available. Fountain in the front yard. Huge master bedroom 18'6x13. Massive corner lot. This home is well layed out & pe rfect for families of all sizes. 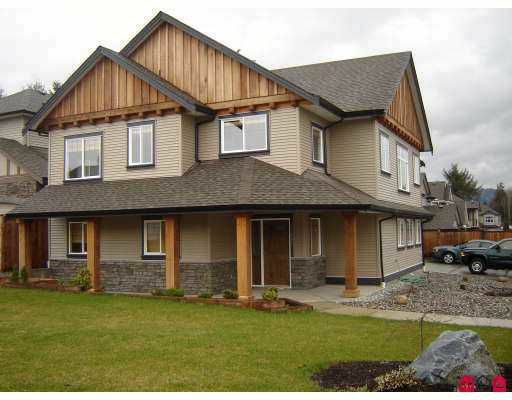 Exterior of home has extensive use wood beams & rock work... A little bit of Whistler right here in Mission!